SWIMWEAR WISHLIST ft. polka dot swimsuit | RAWR BOWS. Whilst rain may never seem to cease in London, it is technically summer in the Northern Hemisphere. These past few weeks in Spain have definitley proved this - and highs of 35˚C make me want to live in gorgeous bikinis like this leaf print bikini or this polka dot swimsuit. 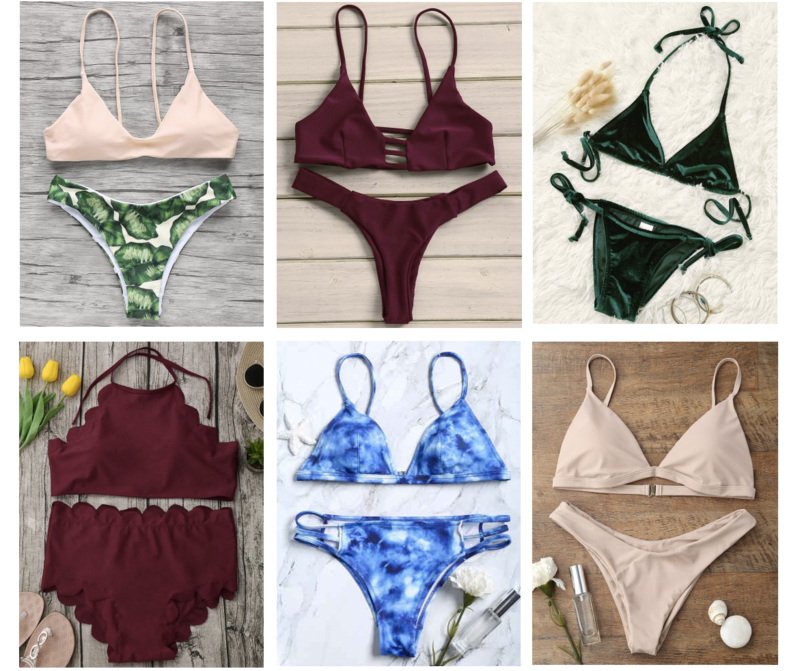 Recently, it feels like there are so many designs, styles and options when it comes to cute swimwear that I end up overwhelmed and going back to my old bikinis because I can't decide what I want to get - and at 50-60€ per bikini I am not willing to buy more than one or two a year. This is why I love Rose gal so much. They have an incredibly varied catalogue and most of their swimwear is between 10-20€ so much cheaper than places like ASOS or Zara. Today I am going to share with you some of my favourite pieces - which I am very tempted to get and knowing myself I'll probably cave in very soon! From my choices you can tell I usually go for simple triangle bikinis - I'm not that adventurous when it comes to styles of bikinis. But I do love getting some cute patterns like the palm tree leaf one - I've been after this pattern for a quite a while, it's so perfect for summery and it goes beautifully well with this pale pink top. The velvety one also looks super cool, and whilst velvet doesn't sound like the ideal fabric to wear to the beach I bet it looks incredible! I would also love to get a high-waisted bikini set like that burgundy one. I've never owned one but I do think they look pretty cool - my only concern is the tan lines, as I'm not very into having a pale stomach... but I'll see if I am brave enough to stray away from my go-to style. If I were you I would be expecting a haul pretty soon - because we all know how much I like shopping and it's summer so I guess I need new bikinis? I'll go with that!